There aren't many car modifications that are affordable, simple to install, and actually make a noticeable difference on your car. Luckily, these billet aluminum dogbone/pendulum mount inserts from 034Motorsport fit the bill. They reduce the amount of movement of the stock dogbone/pendulum mount, making your shifts more direct and your drive-line more rigid. Audis and Volkswagens with the MQB series engine use a very soft OEM dogbone/pendulum mount on the front sub-frame. This mount is there to prevent the engine from torquing forward and backward. The only problem is, it's too soft. 034Motorsport's solution to this issue is this billet aluminum insert. Instead of completely replacing the OEM mount, it modifies it slightly by filling the voids, striking the perfect balance of comfort and performance. When daily driving you won't notice any difference; driving aggressively or on track is where this product shines. I'd go as far to say that it's a must if you've added any considerable amount of power to your car as well. 034Motorsport offers two variants of their Dogbone Mount Insert as some Mk7 GTI & Golf R models are equipped with a different factory dogbone mount than the rest of the models. The image below clearly demonstrates how to determine which mount you have and which variant insert you will need. 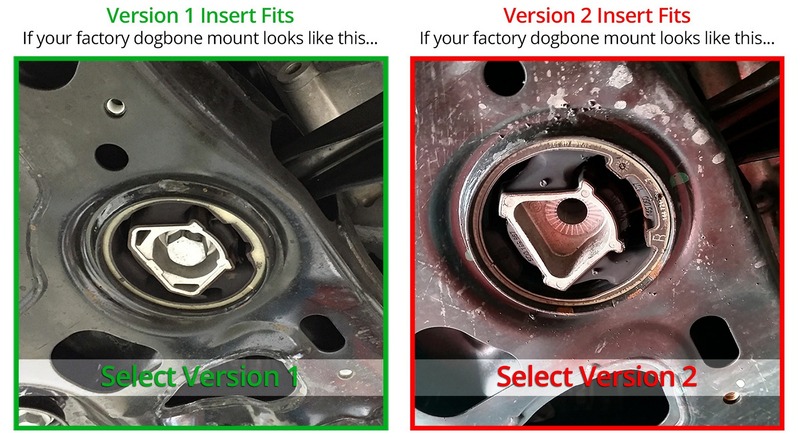 In this Really Quick Product Review, Nate Vincent, our Director of Motorsports, demonstrates why Dogbone mount inserts are needed on the sub-frame of our infamous Project MK7. If you like this Really Quick Product Review, subscribe and check back here for regular releases in the future.